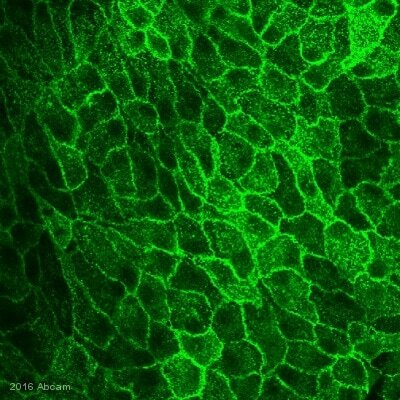 The monoclonal antibody will detect podoplanin on the surface of mouse lymphatic endothelial cells and some epithelial cell types by immunostaining or immunohistochemistry. 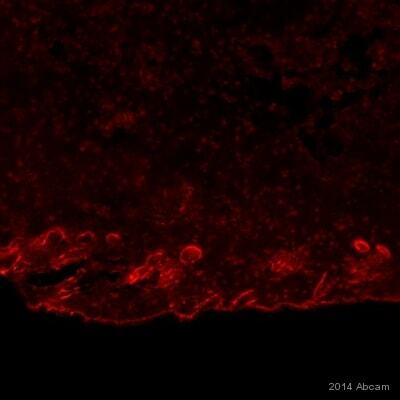 This antibody is designed to detect podoplanin, which is also referred to as gp38 (mouse and rat) and gp36 (human). Tissue, cells or virus corresponding to Mouse Podoplanin/ gp36. Monoclonal antibodies were produced by immunizing Syrian hamsters with a murine thymic stromal cell line. Our Abpromise guarantee covers the use of ab11936 in the following tested applications. IP Use a concentration of 2 - 10 µg/ml. WB Use a concentration of 1 - 5 µg/ml. 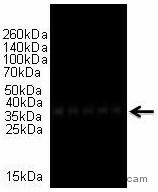 Predicted molecular weight: 36 kDa. 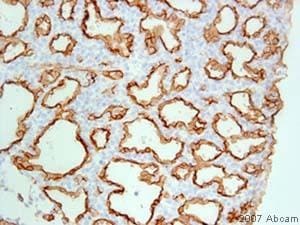 Immunohistochemistry (Formalin/PFA-fixed paraffin-embedded sections) - Anti-Podoplanin / gp36 antibody [RTD4E10] (ab11936)Image courtesy of an anonymous Abreview. 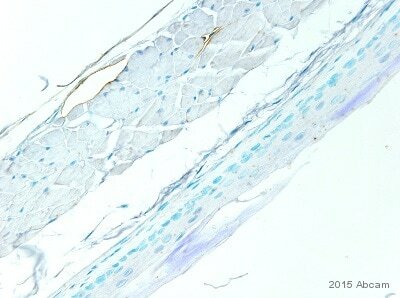 ab11936 staining Podoplanin / gp36 in murine skin tissue sections by Immunohistochemistry (Formalin/PFA-fixed paraffin-embedded sections). Tissue was fixed in paraformaldehyde and an enzymatic antigen retrieval step was performed using Protein K. Samples were then blocked with 5% serum for 30 minutes at room temperature and then incubated with ab11936 at a 1/400 dilution for 16 hours at 4°C. The secondary used was a biotin conjugated goat anti-hamster IgG used at a 1/500 dilution. 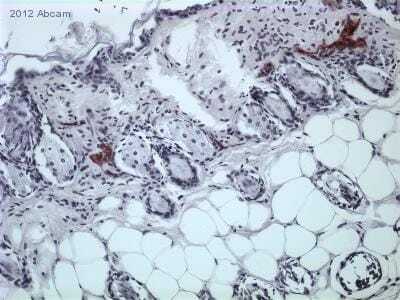 ab11936 staining Podoplanin / gp36 in mouse lung tissue sections by Immunohistochemistry (IHC-Fr - frozen sections). Tissue was fixed with formaldehyde. Samples were incubated with primary antibody (1/80 in PBS + 1% BSA) for 16 hours at 4°C. A Biotin-conjugated goat anti-hamster IgG polyclonal (1/500) was used as the secondary antibody. 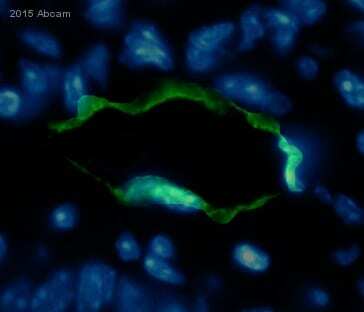 Podoplanin is revealed in green (Alexa Fluor® 488) and nucleus are counterstain in blue (DAPI). Streptavidine-Alexa Fluor® 488 was used to increase signal. Immunohistochemistry (PFA perfusion fixed frozen sections) - Anti-Podoplanin / gp36 antibody [RTD4E10] (ab11936)This image is courtesy of an abreview submitted by Justin Kenkel, Stanford University. Immunohistochemistry (PFA perfusion fixed frozen sections) analysis of mouse liver tissue sections labeling Podoplanin / gp36 with ab11936 at 1/250 dilution. Cells were fixed with formaldehyde, followed by blocking with PBS + 0.1% Triton X-100, 1% BSA, 10% goat serum for 1 hour at 25°C. 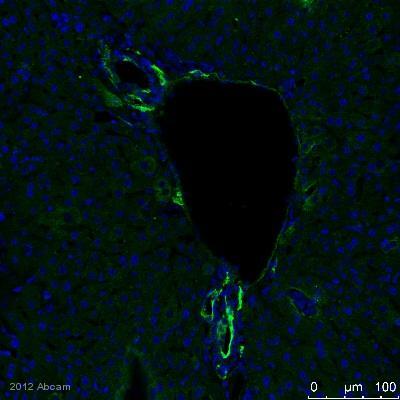 A polyclonal goat anti-hamster Alexa Fluor 488 secondary antibody was used at 1/500 dilution. Flow Cytometry - Anti-Podoplanin / gp36 antibody [RTD4E10] (ab11936)This image is courtesy of an abreview submitted by Dr Xiao-Ming Sun, University of Leicester. 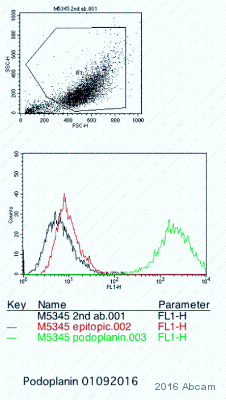 Flow Cytometry analysis of mouse lung cell effusion labeling Podoplanin / gp36 with ab11936 at 1/100 dilution.